The Japan Consortium for International Cooperation in Cultural Heritage (JCIC-Heritage) held an international symposium (co-organized with the Agency for Cultural Affairs) on “The Silk Roads as a World Heritage Site: Tracing the origins of Japan’s international cooperation in cultural heritage,” which took place at the Iino Hall on September 27. The decision was made this June to inscribe the “Silk Roads: the Routes Network of Chang’an-Tianshan Corridor” on the list of World Heritage Sites. The symposium covered topics related to this inscription, including previous support from Japan for inscription of the Silk Roads as a World Heritage Site, the significance of the listing, and the relationship between the Silk Roads and Japan. 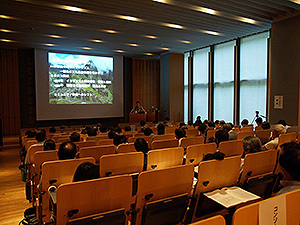 During the first half of the symposium, YAMAUCHI Kazuya, the Head of the Regional Environment Section of the Japan Center for International Cooperation in Conservation, delivered a keynote lecture entitled “Japan’s Contribution to the Inscription of the Silk Roads as a World Heritage Site.” In addition, Xiaofei WANG, Director of the Cultural Heritage Bureau at Turpan Prefecture was welcomed from China and Dmitriy VOYAKIN of Archaeological Expertise LLP was welcomed from Kazakhstan to lecture on efforts and resources to nominate world heritage sites in their respective countries. A panel discussion on “The Silk Roads and Japan” took place during the latter half of the symposium. Panelists were 4 experts on the Silk Roads (KURANAKA Shinobu of Daito Bunka University, SAITO Kiyohide of the Archaeological Institute of Kashihara, Nara, MORIMOTO Kosei from Todaiji Temple, and YOSHIDA Yutaka of Kyoto University), and the discussion was chaired by MAEDA Kosaku, Vice Chairperson of JCIC-Heritage. Panelists talked about the links between the Silk Roads and Japan in terms of their own areas of expertise. The symposium had 300 attendees and provided an opportunity to inform a large audience of Japan’s considerable contribution to the inscription of the Silk Roads on the list of World Heritage Sites. On June 26 and 27, the Japan Consortium for International Cooperation in Cultural Heritage (JCIC-Heritage) co-organized a seminar on Community Involvement in the Management of Cultural Heritae with the National Museum of Ethnology. The seminar took place at the National Research Institute for Cultural Properties, Tokyo and at the International House, Osaka. Over the past few years, there has been a clamor for public involvement in the management of cultural heritage in terms of promoting the coexistence of cultural heritage and tourism development. This clamor has arisen at the local, national, and international level, but the problem is that attempts to answer that clamor have not fared well. Given this reality, a seminar on Public Involvement in the Management of Cultural Heritage was held to specifically discuss the local community’s role and potential in terms of the management of cultural heritage. A lecture was given by SEKI Yuji, Vice Chairperson of JCIC-Heritage and Chairperson of the Latin America and Caribbean Subcommittee, explaining the purpose of the seminar and the issues in question. Afterwards, examples of the state of management of cultural heritage involving local residents were described by NISHIYAMA Noriaki (Peru), Head of the Hokkaido University Center for Advanced Tourism Studies, YAOITA Kiho (Fiji and Peru), an Appointed Associate Professor of the Hokkaido University Center for Advanced Tourism Studies, MASUDA Kanefusa (Micronesia) of the Japanese Association for Conservation of Architectural Monuments, and MATSUDA Akira (Italy and the UK), a Lecturer in Japanese Art and Artistic Heritage at the University of East Anglia. A panel discussion took place after the lectures. Based on the examples described during the lectures and in light of questions from the audience, panelists actively discussed issues with the concept of community involvement, issues with its implementation, and the potential for community involvement from the perspective of international cooperation. The seminar had around 130 attendees during the 2 days in which it took place. Questions and views were proffered from various perspectives related to the management of cultural heritage, indicating the considerable interest in this topic. In February and in May, the Japan Consortium for International Cooperation in Cultural Heritage (JCIC-Heritage) supported surveys of the current state of museums and cultural heritage in Sri Lanka since the civil war. These surveys were part of a cultural cooperation program of the Japan Foundation (project participants: KOIZUMI Yoshihide, Supervisor of Planning in the Department of Planning of the Tokyo National Museum and FUKUYAMA Yasuko, Associate professor in the Faculty of Intercultural Communication of Ryukoku University). The project was implemented on the basis of survey studies on international cooperation of Sri Lanka by JCIC-Heritage in 2012. 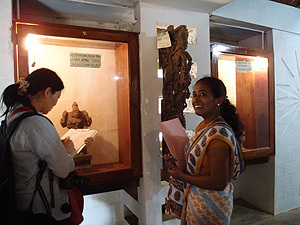 With the cooperation of the Department of Archaeology of Sri Lanka, exhibits and collections were surveyed and information on conservation of cultural properties was gathered primarily in museums in the north (the Jaffna region) and the northeast (the Trincomalee region). These regions had been affected by a civil war that lasted 26 years (1983–2009). Future strategies for conservation and use of cultural properties since the end of the civil war were discussed. For several years, Sri Lanka has worked to establish cultural facilities and develop regions using cultural properties while taking regional characteristics into account. These efforts are led by the Department of Archaeology and they seek to restore regions affected by the civil war. Jaffna is a unique place in Sri Lanka where one can see the religious imprint of Buddhism, Hinduism, and Christianity, and Jaffna retains various cultural heritage sites with surviving buildings from the colonial period. Trincomalee has many vestiges of Buddhism as well as a history as a center of maritime activity and foreign trade. Plans are underway to establish museums and cultural centers by reusing historic buildings in both regions to appeal to domestic and foreign visitors. That said, the regions face numerous problems in terms of managing cultural properties in existing museums, exhibiting those properties, and personnel to exhibit them. Survey participants provided instructions and suggestions on exhibition plans and management techniques as they exchanged opinions with local personnel. Sri Lanka has just begun local development that draws on cultural properties in regions that have survived a civil war. The Department of Archaeology needs foreign support in the form of dispatched experts, instruction of personnel, and funds. JCIC-Heritage hopes to continue exploring the potential for cooperation in order to help the regions recover. 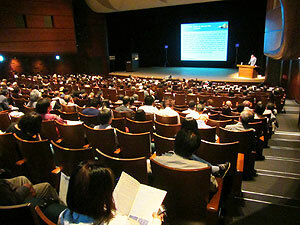 The 2013 General Assembly of the Japan Consortium for International Cooperation in Cultural Heritage convened and the 14th seminar on “International Trends in Safeguarding Cultural Heritage” was held. 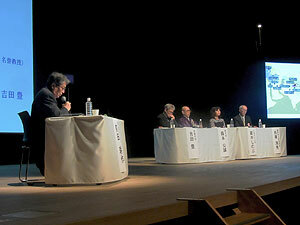 The 2013 General Assembly of the Japan Consortium for International Cooperation in Cultural Heritage was convened on March 7th. The Secretariat General reported on Consortium projects in 2013 and projects planned for the coming year. This was followed by the 14th Seminar, which started with a keynote lecture by ANDO Hiroyasu, President of the Japan Foundation, entitled “International Cooperation and Exchange through Culture―In View of Mutual Relationship.” Afterwards, four other lectures described recent trends in the safeguarding of cultural heritage with a focus on discussion at the international conferences that took place last year. MOTONAKA Makoto, senior researcher of cultural properties in the Monuments and Sites Division of the Agency for Cultural Affairs, delivered a lecture on the evaluation process prior to the inscription of Mt. Fuji on the World Heritage list along with issues arising after its inscription. FUTAGAMI Yoko, Head of the Research Information Section of the Department of Art Research, Archives, and Information Systems, reported on the deliberations that took place at the 8th Session of the Intergovernmental Committee on the 2003 Convention for the Safeguarding of Intangible Cultural Heritage. Ms. FUTAGAMI also described issues discussed by the Committee and recent topics concerning the Convention. KURIHARA Yuji, Secretary General of the National Research Institute for Cultural Properties, described Japan’s campaign to host the ICOM General Assembly and prospects for the future. Last but not least, MAEDA Kosaku, Vice Chairperson of the Japan Consortium for International Cooperation in Cultural Heritage, gave a presentation regarding the 12th Expert Working Group Meeting on the Safeguarding of the Cultural Landscape and Archaeological Remains of the Bamiyan Valley, Afghanistan. The meeting took place last year in Orvieto, Italy. The topic of international trends in safeguarding cultural heritage is usually brought up at seminars each year, and this year’s seminar had more than 100 attendees. Information on recent trends is greatly needed. The Japan Consortium for International Cooperation in Cultural Heritage will continue its efforts to share information through seminars.